This month Birchbox have been very clever. They've obviously taken note of the rise in popularity of 'adult colouring in' and this month made the amazing decision to just print a design on the box that you can colour in yourself. They've even included a mini pack of crayons in the box for you to use. 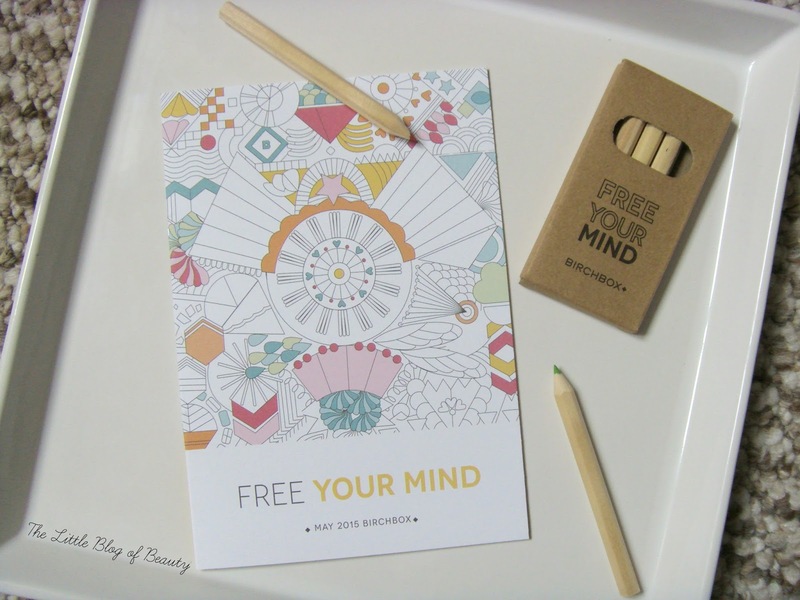 I'm a big fan of colouring in and already have a three colouring books I'm working my way through, so I love the idea of this months 'Free your mind' box*. A well designed box is definitely a good start but the contents of this months box are also pretty impressive. When I opened my little drawstring pouch the first sample I saw was what I thought was a perfume sample and I did a little sigh. As you may be aware I'm not a fan of perfume samples in subscription boxes and prefer not to receive them. However I spotted 'lip' on the packaging and then discovered this is actually a Mirenesse Mattfinity lip rouge. 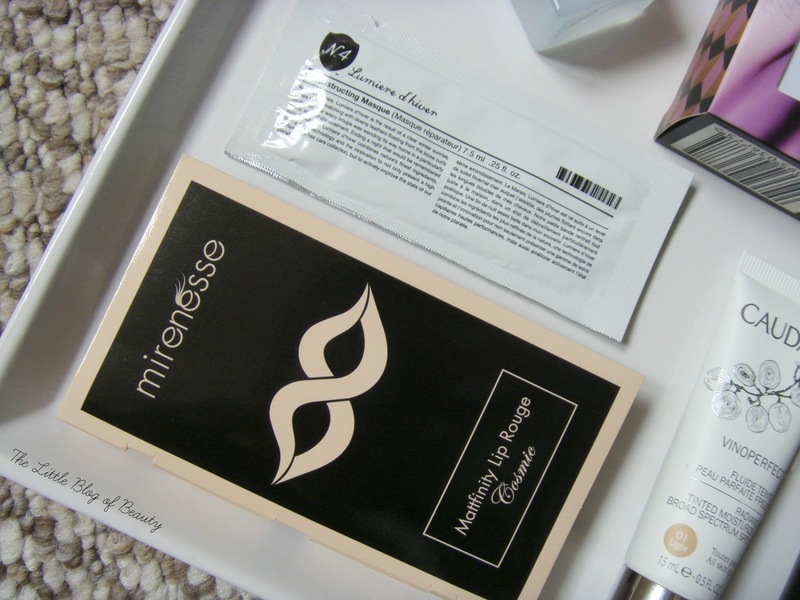 Although I have heard of Mirenesse I know very little about the brand and haven't tried any of their products. This is a 1.7g sample of a matte liquid lipstick in packaging that makes me think of the Sephora liquid lipstick (I forgot to get a picture of it). It has a 'lip hug' applicator, meaning it's slightly curved to fit over your lip and is supposed to have a plush velvet finish that sets in 15 seconds. My shade is 6. Paris, which appears to be a dark berry shade. Next up is what I thought was a face mask sachet but on closer inspection it's a Number 4 Lumiere d'Hiver Reconstructing (hair) mask. I've never heard of this brand before but this is a luxurious sounding mask containing soy proteins, shea butter, sunflower and jojoba seed oils and is supposed to leave hair smooth, straightened and shiny. This is one you pop in after shampooing before rinsing out 2-5 minutes later. I believe the full size product contains 150g and costs £36, so it's definitely on the luxury side. This is a 'beauty extra bonus' product this month. 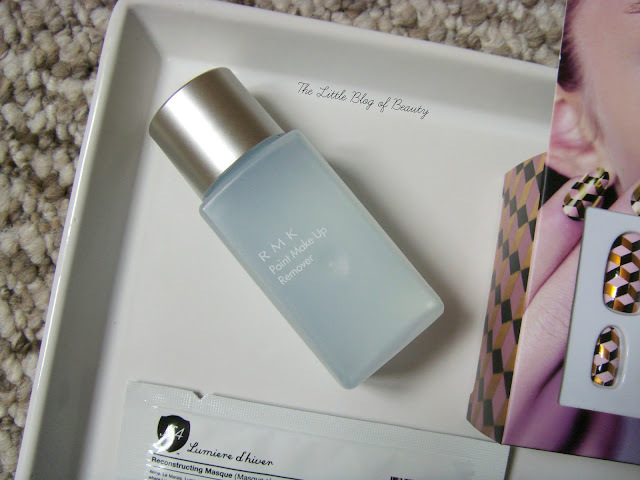 I spotted a small Caudalie bottle and again sighed thinking I'd received the same product in a recent box. 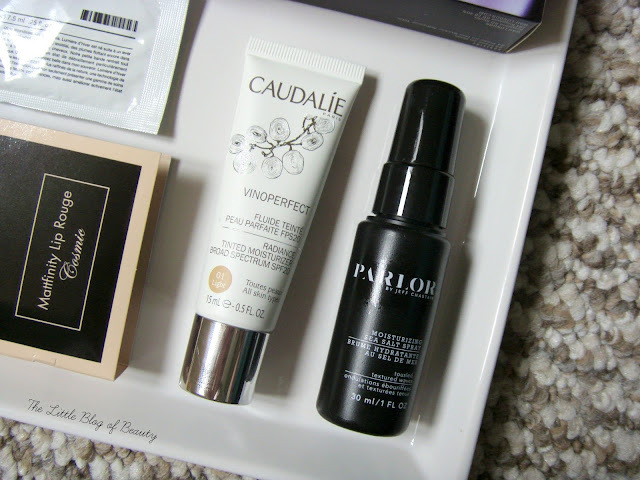 I shouldn't have judged a product by it's packaging though as rather than the Vinoperfect serum I thought it was it's actually the Caudalie Vinoperfect Radiance tinted moisturiser. Luckily I did receive the shade light (although I believe only two shades are available) but after a quick hand swatch I don't think this is going to be light enough for me. Although I don't think receiving multiple products from the same brand is ideal for a subscription box I don't mind so much when it's a brand like Caudalie. Next I found a little plastic bottle (great for travelling!) of RMK Point make up remover. I've only tried one RMK product before, their cleansing balm, which is gorgeous and comes highly recommended by Selfridges Birmingham's beauty personal shopper Rose. This is a bi-phase remover (so you give it a good shake before use) which is supposed to sweep away waterproof mascara and heavy eye makeup with ease and is also apparently moisturising. My second to last sample is a Parlour by Jeff Chastain Moisturising sea salt spray. I have a few of these dotted around but have never really used them before. As I mentioned in my last post I'll be filming a lot over the next few months so hair and makeup will have control over my hair a lot of the time. On my days off I think I might just go with a quick wash and a squirt of something like this for minimal effort and to give my hair chance to recover from the probably excessive back combing I'll end up experiencing! Finally I found a box of WAH London 24 press on nails. WAH is the pick your sample this month and you can choose from a nail varnish, nail art pen or the press on nails. I'm not normally a fan of false nails but these have really caught my eye. The design on mine is unusual and eye catching and they also look reasonably long. When my nails are long (I've actually just had to cut them all off!) false nails are often shorter than my natural nails. A problem I also have is that I have very slim fingers and false nails are usually far too wide for me to wear, but so far these are looking good. I might try these next time I head to stay at my boyfriends and I'll report back in a post. If you include the crayons this months box actually contains seven products and I'm looking forward to trying every one of them. Although I'm more of a felt tips person for colouring in, so I'm not that excited by the crayons (although they are actually pretty good!). Finally the clue for the June Birchbox is that it's another collaboration and rather than a 'pick your sample' next month you'll be able to pick your box design. You can sign up to receive the May 'Free your mind' box on the Birchbox website. 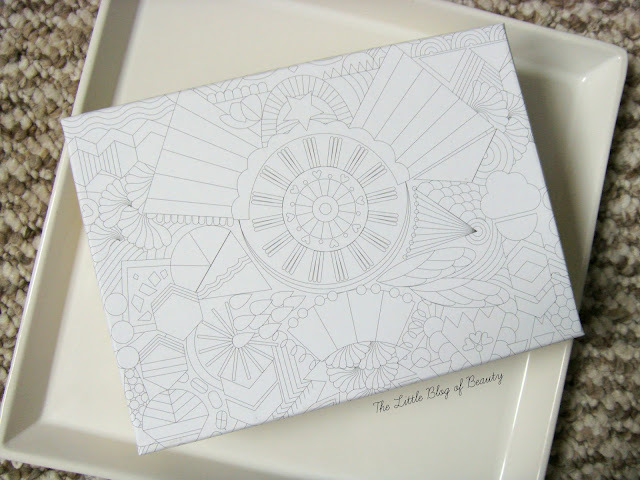 What do you think of colouring in your own Birchbox? I received the same items as you in my box :) I think this month's content is great, I'm very happy with every item!